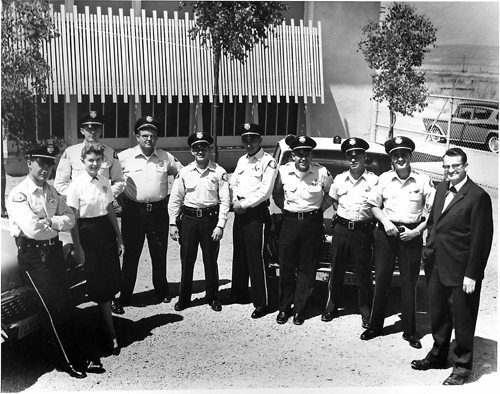 The Milpitas Police Department originated with the incorporation of the City of Milpitas on January 26, 1954. The City’s first Police Chief was Thomas Letcher. Letcher had just one fulltime Sergeant under his command, while patrol duties were handled by Auxiliary Police Officers working on a part-time basis. Most had other fulltime jobs, and worked as officers in Milpitas on their days off; these auxiliary officers were paid $1 an hour in the 1950s. Officers from that time recall that the patrol car in use was a 1955 Ford equipped with a “Police Package,” which included a stick shift and a siren that was activated manually by pulling on a wire. Many of these auxiliary officers, including future Chief James Murray, were Korean War era veterans, foreshadowing over a half century of ties between the Milpitas Police Department and the nation’s armed forces. When Chief Letcher departed in 1957, Chief James B. Murrayassumed leadership of what was then a two-person organization. Over the next several years and decades, Chief Murray embarked on the steady build-up of the Police Department so that it could continue to properly police the growing city. 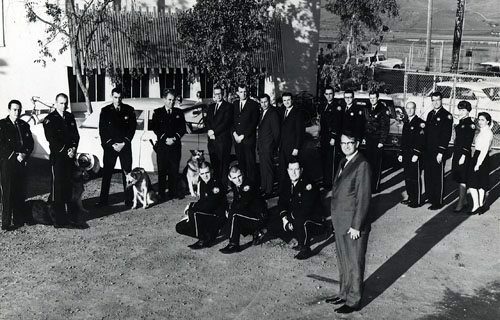 By 1967 the Police Department had grown to 23 sworn personnel, including 2 Lieutenants and 7 Sergeants, 12 Police Patrolmen and one “Police Woman” (as a sign of the times, this employee was classified separately from the “Police Patrolman” position; for decades now the distinction in positions between male and female officers has been eliminated). Throughout the years the police department did not operate in a vacuum but was very much a reflection of the community and nation that it served. A roster of the Milpitas Police Department circa 1967 indicates that three of its Police Officers were on military leave associated with the Vietnam War. Chief Murray’s reign lasted for three decades, and he was considered by many to be one of the most innovative police chiefs of his era. He sought to professionalize his police force and was a pioneer in removing barriers that theretofore had prevented minority and female officers from obtaining jobs in law enforcement and from advancing in their careers. Murray was the first California police chief to require a 2-year college degree for police officers (1957), he required applicants to pass psychological screening (1960), he eliminated height and weight ratios for all applicants, and in 1980 appointed a female officer to the SWAT team, another first for California. In 1973 he sought a closer partnership with the community by implementing a Youth Neighborhood Officer Traffic Program, the first of many programs to come. 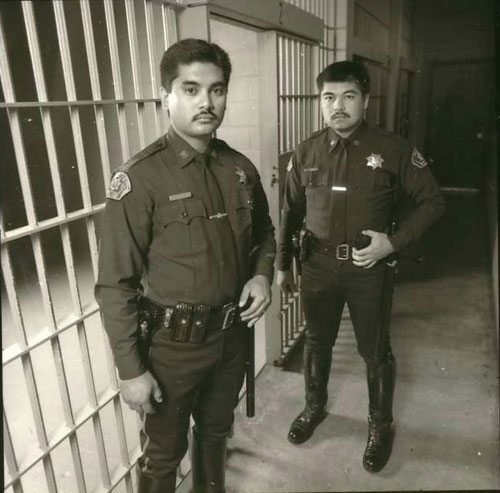 The 1980s saw a whirlwind of activity, including the implementation of motorcycle officers, a DUI enforcement team, and the start of the DARE program in Milpitas schools. Perhaps because Chief Murray set high standards and was a trailblazer and innovator, the Milpitas Police Department tended to attract quality officers, many of whom left to become Police Chiefs in other Californian law enforcement agencies and in states as far afield as Colorado and Illinois. personnel first moved into in 1991. In this era employees of the Milpitas Police Department, far from being immune to international events, once again supported their country in a time of crisis: two employees were called up and deployed in support of Operations Desert Shield and Desert Storm in the Persian Gulf. Aside from overseeing the development of, and move into, the new police headquarters, Chief Acosta continued with many of the community-focused programs initiated by Chief Murray, which by this era had come to be called community oriented policing. Among the programs initiated under Chief Acosta was a citizen’s academy-known in Milpitas as P.A.C.E.S (Police and Community Educational Seminars)-which allowed local residents to get a first-hand glimpse of the inner workings of the police department. Throughout his tenure Chief Lawson focused on reducing crime through community outreach, and in 2001 he created the Senior Volunteer Program, which by 2005 had expanded to 27 active volunteers who engage in a variety of activities, ranging from assisting the Traffic Safety Unit at DUI checkpoints, to fingerprinting children at local shopping malls. In 2001 he introduced Compstat to Milpitas. Compstat combines timely and accurate crime analysis with effective tactics, rapid deployment of personnel and resources, and continuous reassessment of our crime fighting efforts, while focusing the entire organization on our primary mission, keeping the citizens of Milpitas as safe as possible from crime. The net result of these programs and many others implemented or improved by Chief Lawson, was that crime fell for seven straight years during his tenure, and today remains significantly lower than at its peak two decades ago, even though Milpitas’s population has grown significantly since then. 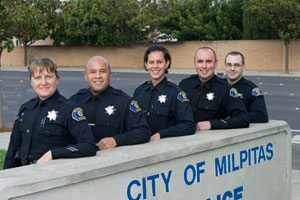 The Milpitas Police Department reached the peak of its growth in 2002, when it employed 95 sworn officers and nearly 30 civilian support staffers, not counting its 38 crossing guards and the many volunteer Explorers and Seniors. During the Lawson era service to country continued to be a police department hallmark. Within months of the 9-11 attacks in 2001, a veteran Milpitas officer was deployed in support of the Homeland Security effort. In 2005 Charlie Lawson retired as Chief to become Milpitas’s City Manager; Thomas Nishisaka was appointed Interim Police Chief. Under his leadership crime prevention innovation continued. In 2005 he reorganized the Police Department’s community relations unit to establish two School Resource Officers at Milpitas High School, which upon implementation was lauded by local officials as a very successful, welcome new program. Inevitably, international events continued to play a role in the history of the Milpitas Police Department. One of the first officers hired by Chief Nishisaka was an army veteran who had served in Afghanistan in post 9-11 military activities. Chief Nishisaka retired in 2006. On August 20, 2010 Dennis Graham was sworn in as Milpitas’ youngest Police Chief since James Murray was appointed in 1957. Innovation was the standard as the department benefited from a vibrant workforce full of ideas for improvement. In November of 2006 Chief Graham greeted an international delegation of law enforcement professionals, including a Dutch author and specialist in technological innovation, who visited to study the police department’s state-of-the-art Computer Aided Dispatch system, which substantially reduced emergency response times for the Police and Fire departments. Chief Graham teamed with the Fire Department, the City Manager, political leaders, and the county to bring to Milpitas Emergency Medical Dispatching, ensuring that citizens with the most urgent injuries receive the closest available ambulance, and pre-arrival instructions from dispatchers that enable the reporting party to provide immediate aid while awaiting paramedics. Other service improvements included on-line reporting, allowing citizens to file crime reports over the Internet; the Parent Project, a course taught by specially trained police officers to help parents address behavioral issues with teenagers who are acting out; in-house leadership development programs for Lieutenants, new Sergeants, and line level personnel; the use of specially trained K-9 teams in conjunction with SWAT; ad hoc strike teams initiated by line level officers to address “hot spots” and stop specific crime trends; and the creation of the Technology Applications Group, a team of talented and motivated officers who identify, devise, modify, and employ high tech surveillance, tracking, and other systems that have resulted in the arrest of numerous criminals and ended significant crime trends. In 2006 the Milpitas Police Department provided Islamic cultural awareness training to all sworn officers, including ranking personnel, and was among the first agencies to provide community crime prevention presentations to help parents and juveniles negotiate the safety issues associated with the use of social networking systems such as MySpace and Facebook. In November of 2008, the Milpitas Police Department was honored by the International Association of Police Chiefs as a semi-finalist for the Webber Seavey Award for Quality in Law Enforcement for reducing gang violence on the Milpitas High School campus via a multi-faceted venture with the community through training, education and outreach, a key component of which was a joint process between the police department and high schools which created new standards to address campus gang issues, resulting in a 55% reduction in the number of campus assaults in the 2007-2008 school year. As a result of these and other initiatives, crime in Milpitas dropped in each of the first five years of Chief Graham’s leadership, in 2010 reaching an all-time low crime rate, and the lowest violent crime rate since 1972, in spite of the national and state fiscal crisis which resulted in a decline in staff during a period of steady population increases. In 2010 and 2011, youth emerged as one of the highest priorities. Chief Graham and his staff worked closely with the City Council to implement a Social Host Ordinance that holds accountable individuals who allow or serve alcohol to minors; to implement at Milpitas High School the Every 15 Minutes program, an intensive, two-day event that includes a staged DUI traffic crash, mock funeral, and significant team-building exercises between students, teachers and law enforcement leaders on and away from campus; and the Character Counts program, an ethics-based course taught by police officers at all elementary schools in Milpitas. The Milpitas Police Department now offers child car seat safety checks to Spanish-speaking residents, and is one of the few police departments to offer this service to all citizens in Spanish and English. Milpitas has one of the most diverse populations on earth, with over 50% of its population born in a foreign country, and is home to more than 30 churches, temples and mosques. Ensuring that all citizens enjoy the constitutional right to worship as each sees fit is essential to an orderly and safe society, and the Milpitas Police Department supports this concept through significant community outreach and its famous open-door policy: Chief Graham will personally meet with any person or group concerning any police department or public safety issue. During 2009-2011 Chief Graham visited all three Islamic Mosques in Milpitas, and has attended worship services or events at many of the other churches and temples in the city. We believe that creating and sustaining a positive work environment for employees results in better service to our citizenry, so in 2010 the police department established our Peer Support Program, with nearly ten percent of department employees participating as peer supporters to assist colleagues who have experienced critical incidents on-duty, or who have sustained significant emotional events off-duty for which personal support is required. To ensure the quality of all our programs and services, in 2009 the police department began to regularly survey residents who have come into contact with our police officers and dispatchers. These surveys continue in 2011, and it is our belief that the feedback that we receive from them is crucial in helping us to remain innovative and responsive to our citizens. The Milpitas Police Department is currently compiling anecdotes related to our history, as well as artifacts for possible display in our lobby. If you are a former employee or have knowledge of the department’s history that you would like to share, we invite you to contact Chief Steve Pangelinan.